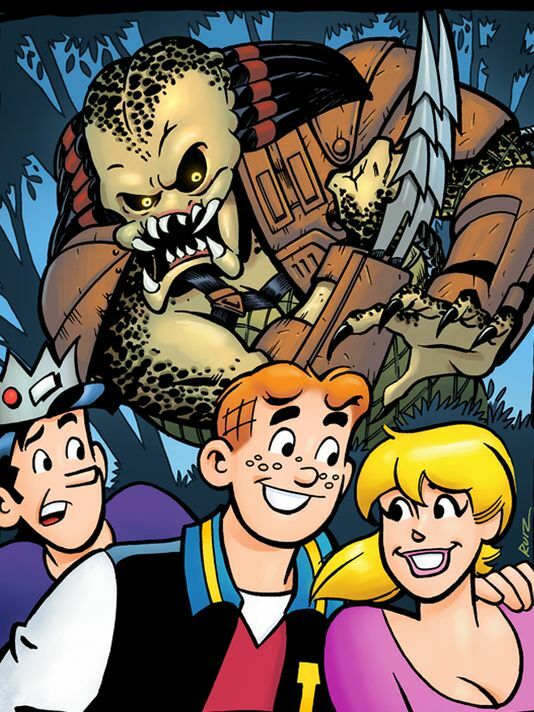 The Horror Honeys: Honey Buzz ~ Archie and Jughead and Predator? Honey Buzz ~ Archie and Jughead and Predator? Archie Andrews will cross paths with the sci-fi horror badass Predator in a new four-issue crossover series Archie Meets Predator. The series will be written by Grindhouse writer Alex de Campi, drawn by Fernando Ruiz, and co-published by Dark Horse and Archie Comics. The series follows the whole Riverdale gang – Archie, Jughead, Betty, Veronica, and others – vacationing in Costa Rica for Spring Break, where they encounter the Predator. "After Betty is revealed to be borrowing Cheryl Blossom's clothes to compete, she and Veronica have a fight and she tearfully runs off into the jungle where, let's say, she isn't alone," de Campi says. De Campi hints that when the gang leaves Costa Rica, they’ll have a little extra luggage. “Everybody does end up back in Riverdale,” she says, "as do those big trunks of clothes that Veronica brought. Trunks so big, you could hide a Predator in them. Her Vuitton will never quite smell the same again." Archie Meets Predator will hit stands in spring 2015.